No more peel-off film, we use Instax wide instead. Fujifilm discontinued FP-3000b and FP-100c and make million Polaroid Automatic Land Cameras paper weights or pops for photo shooting. Indeed, if you have a dark bag and an Instax Wide camera, you can use the Instax Wide camera to develop the Instax Wide film photo taken in a Polaroid Land Automatic Camera. 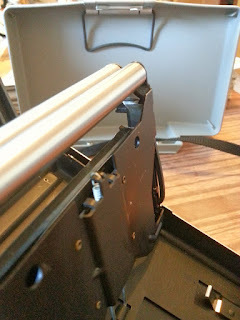 With the help of a dark bag, we can put an Instax Wide cartridge into the film compartment of a Land Automatic. After the shot, use the dark bag to transfer the cartridge to an Instax Wide camera, cover up the lens and take a blind shot, the Instax Wide camera will eject the film and the photo starts to develop. Fujifilm Instax 100 has a wider angle lens and wider field of depth than Polaroid Automatic Land Camera #240. The Polaroid outperform Instax 100 with swallow depth of field and more details captured on the film. Land Camera is a manual focus equipment that allow better focusing when photo shooting. The lens itself gives more details in both over exposure and under exposure areas. Colors captured is more saturated than Instax 100 too. Moreover, I love the darkened photo, which gives the photo another layer of impression. Although ISO rating of Instax Wide film is 800, it is fine to set your Polaroid to ISO 300. 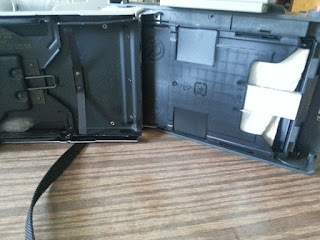 To allow closing the backdoor of the Land camera, I removed the film glider inside the back cover of my Land camera. 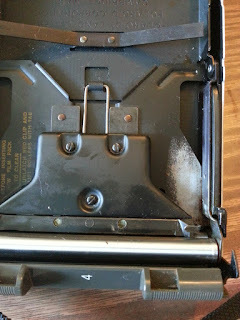 To apply constant pressure to the film when the film cartridge is half used, I put two foams into the slots of the Instax film cartridge. I wish some enthusiasts will make a custom mod kit to allow using an Instax in a Land automatic without a manual swap of film. But before it happens, I am happy with the current solution. 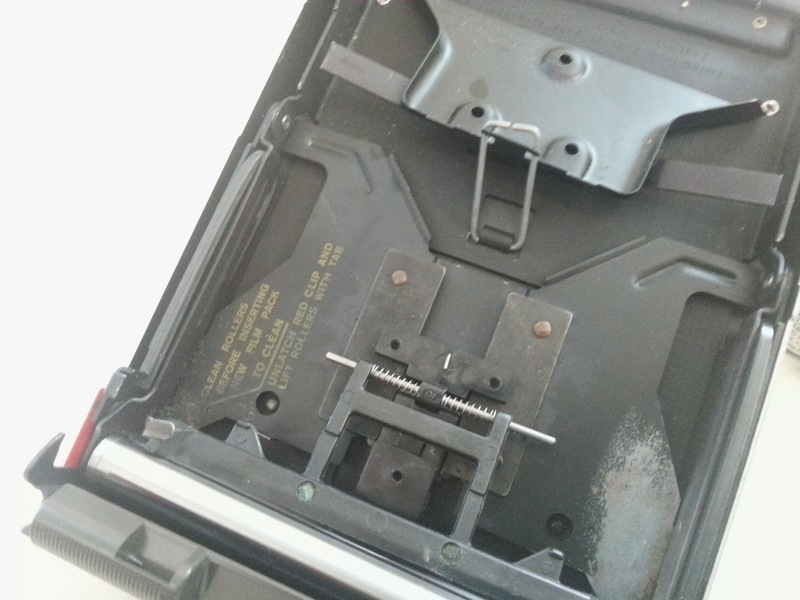 Since the battery used in Polaroid Land Camera was discontinued decades ago, new owner should modify the battery compartment for using market available battery to power it up. Before we decide what battery should be used, we should know the battery voltage requirement of individual Polaroid Land Camera. The cameras use two 3.0V DC power have an electronic timer on the back. The second 3.0V is for powering up the electronic timer. Personally I love the electronic timer which will start timing when I pull the exposed film out from the camera, and beep me when the set time is reached. Many people on the web are saying they can use their iPhone, and etc. to count the time, but those cannot beat the convenience from a built in timer. Mechanical Timer may fail to work but the electronic timer is accurate. Among all these battery, Zinc Air battery provides the highest energy density. Lithium the second and Alkaline is the worst. 1) AAA (LR03) Alkaline battery can be found in your local grocery stores. They are widely available and the price is cheap. the only drawback to use Alkaline battery is the possible leaking of fluid after period of time. 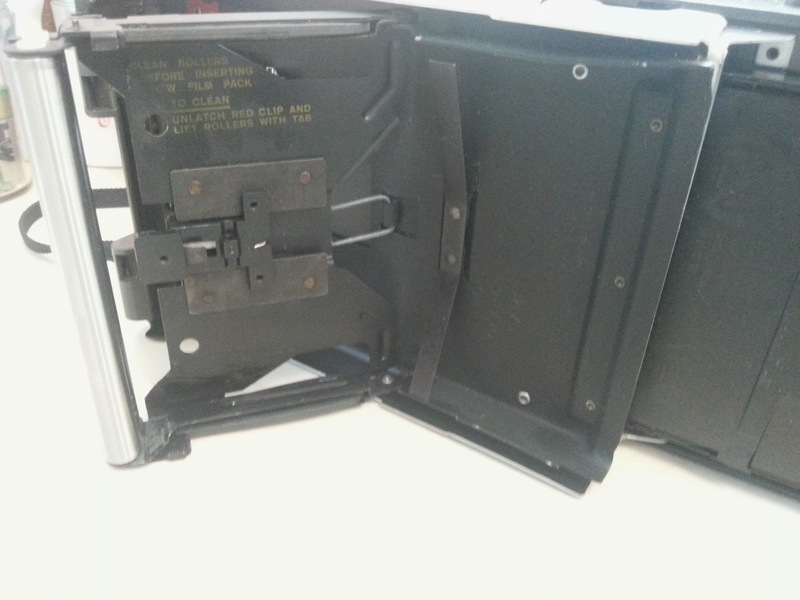 The leaked liquid will damage the electronic circuit and make your machine useless. Each AAA battery is 1.5 volt and has ~800mAh capacity. 2) Many people said Lithium battery (CR123A, CR2) is difficult to obtain. However, if you are a Polaroid Land Camera guy, you can easily get them from the camera shops where you will buy your Fujifilm Instant Pack film (FP-100C or FP-3000B). CR123A is more common than CR2 as they are also being used in other applications like powering up a flashlight. In my opinion, CR2 is going to be obsolete, therefore you should keep in mind when select which battery model you are going to use in your revitalized Land Camera. CR123A (~1,500mAh) has higher capacity than CR2 (~800mAh), but 800mAh is far enough than is needed. Both CR123A and CR2 are 3.0 volt battery. 3) Zinc Air Battery is used for mini devices like hearing aids. They have higher capacity but they have 1.4 volt output. It might be OK for putting two Zinc Air battery in serial to obtain 2.8 volt for a 3.0 volt system. However, the voltage will be lower than "normal" if you put 3 pieces in serial to get a 4.2 volt. Considering the voltage will be dropped further to 1.3 volt after a few hours of usage. The lowered voltage will affects the accuracy of the shutter timing. It can be compensated by adding some light compensation. A Zinc Air battery PR44 type has a capacity of 600mAh in general. 4) If you love the size of PR44 but have doubt on the 1.4 volt, then your only choice is the Alkaline LR44 battery. They have ~100mAh capacity but can output 1.5 volt. 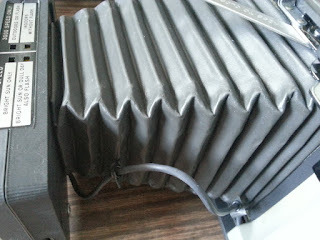 They can power up your Land Camera for a few pack of films (maybe 8 to 10 pack) and will used up completely. Both LR44 and PR44 battery are not easy to obtain. Using AAA (LR03) battery is always the best option in your project. They are easy to obtain and the battery rack you needed to fit into your land camera battery compartment is easy to be found too. However, please take out the battery after use. Otherwise, you will end up with a messy battery compartment and a lot of cleaning job. Lithium battery is also a good source for powering up the 3.0 volt camera. Their high energy density and compact in size makes you worry free on dead battery. If you can get a battery holder for these Lithium battery, just go for it. 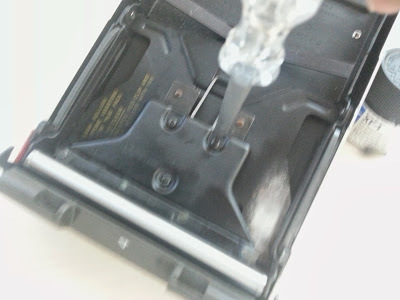 If you cannot get a battery holder....... just use a electrical tape to fix the battery terminals in your land camera to the battery ( the positive battery terminal attach to the White contact, and the negative battery terminal attach to the Black contact ). I don't recommend using LR44 or PR44 in your land camera if you can work out the modification with AAA or Lithium Photo battery. 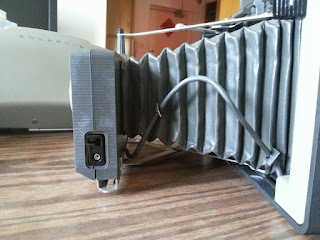 If you want to know how to do the battery conversion of your Land Camera, please visit Instant Option for instructions. You can polish away the rusty surface inside the film compartment if the rust is not heavy. 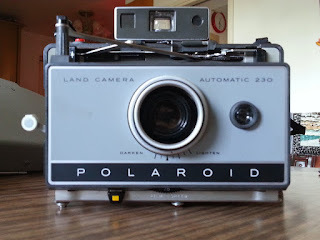 It is an important procedure to save these camera as the chemicals in the developing process which may squeeze out and stay on the metal surfaces inside your Polaroid Land Camera. 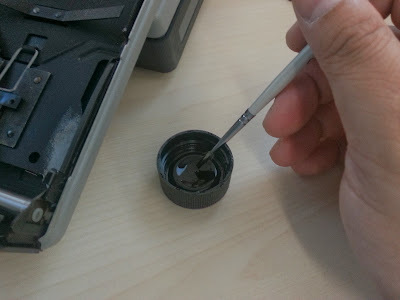 Those developing fluid is lightly corrosive and will get your camera rusty if you don't clean them after use. If there is rust inside the compartment, you can use a #400 or finer sand paper to polish those rusty surface until all rust have been removed. The polished surface is clean and in shiny steel colour. You can check the condition of the metal and verify if the rust is too heavy that the metal is almost 'eaten' away. After you polished the rusty part, you will need to paint the polished surface in black. The painting serve the purpose of protection and also reduce the reflective surface inside the camera. 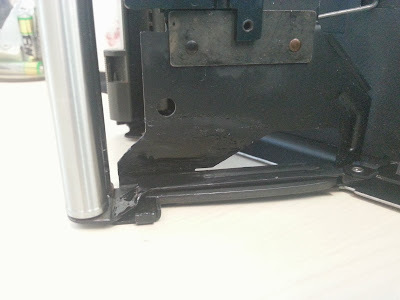 In my camera, the rusty part is close to the rollers and I need to remove the film guider to have the polished area cleared for painting. 3 screw have to be removed. There are 2 small spring underneath the top cover. You must be very careful not to lose them as they are vital to have the film guider in the centre position of the rollers. 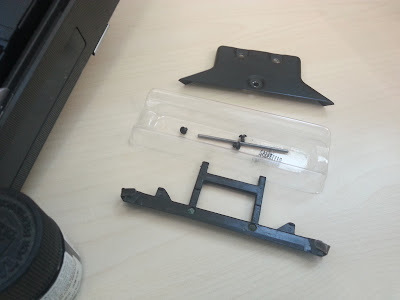 Use a small tray to keep those small parts, you cannot find some of these pieces unless you bought another second hand Land Camera for them. Although spray paint may have better cosmetic result, I prefer to have the area painted. 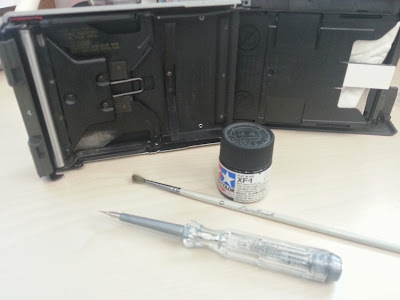 the paint I used is the TAMIYA Acrylic Paint ( Flat Black ). 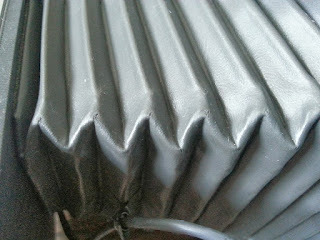 Several layers have to be added to have nicer and stronger finishing. Compared to the original coated black surface, the new paint seems a little bit darker. Anyway, protection is more important than outlook. Therefore, I will say the job is done. Leave the painted surface dry completely after applying extra layers of paint. You can polish the paint away for repainting if it is needed. The outlook is much better now compared to the original rusty chamber. This maintenance will give your Land camera extra years in services. Today I bought a #230 Land Camera from a user on a Photography blog. You may wonder why I bought #230 instead of others. Well, it has plastic case that can be drilled and cut easily. The end product in my plan will have a few switches, knobs and a number of LEDs, therefore a plastic case Land camera is a better option. The condition of the camera is fair. It can be operated and the shutter etc. seems running smoothly. There are two problems that I need to tackle. First is the rusty developing roller part and second is the "possible" light leaking bellow. I cannot test the light leaking at the moment coz I don't have a darkroom at home. A limited test with a bright flashlight in a dark corner in my house suggested that the bellow doesn't have light leaking. So, I will tackle my worry later. But the rusty roller part, I polished it with fine sand paper to remove most of the rust. Some hidden parts, however, cannot be cleaned. I, therefore, used WD-40 to spray those areas and try to dissolve the rust out. The result looks good. I will place it in an open area, open the film chamber, place an used Instant film cartridge (stuck with thick tissue paper) and wait for at least 2 days letting the WD-40 to vaporise before I paint the polished area. Drops of silicon oil will be added by that time to lubricate the rollers and joints. 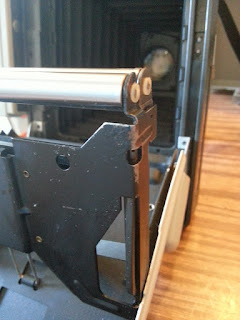 The whole machine casing (except the lens) was cleaned with alcohol. Some area with rigid dirt was cleaned with a WD-40 sucked cloth. DO NOT use water to clean this machine. DO NOT use WD40 on the bellow. I have not figure out if it is coated with PVC or other kind of rubber, but WD40 will harm these old synthetic rubber. SO, DON'T use WD40 on the bellow. Alcohol should be good enough. The machine is cleaned now, and is ready to be modified with a micro-processor controlled manual and automatic exposure camera. Of course, I will take it out and take a few shot before I start modifying it into a digital machine. By the way, #230 is a 4.5V machine. The ex-owner connected a CR123A (3V) with a AA (1.5) battery to get the 4.5V to work. I must, at here, emphasis NOT to do so. It may result in fire hazard. The energy density of a Lithium battery is much higher than an AA battery. You need to use batteries of same type to power up the gear. 3 x LR44 (PR44 is the best) is a good choice if you are lack of experience to hack electronic gadgets. 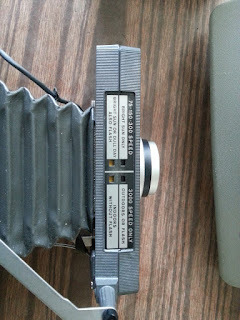 A few photos are enclosed to record the "pre-modification" state of the camera. 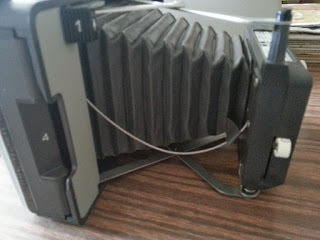 My Polaroid #240 Land Camera. 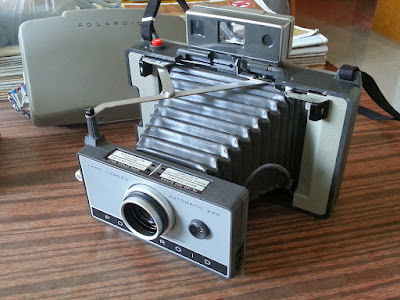 Polaroid Land Camera is a piece of art in Photography history. 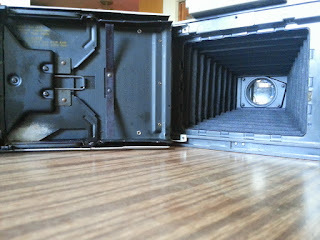 It is a camera uses Instant Peel Film. You can now buy cheap second hand Land Camera from ebay.com at low cost. Some modification to the battery compartment should be done as these machine powered by either 4.5V or 3V batteries that were not produced for long. 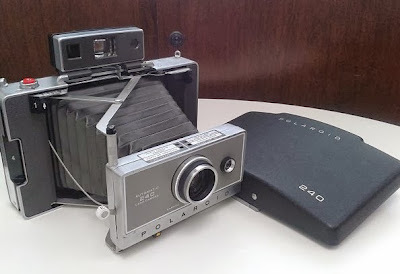 I have two Land Cameras - A #350 with Zeiss Range Finder and Glass Lens and a #240 with Polaroid Range Finder. 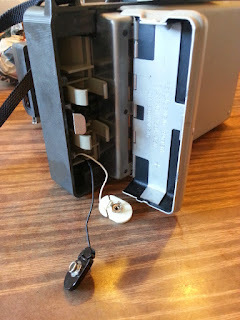 #240 - rewired a broken circuit inside the shutter compartment to make the shutter work again, and make a 3xLR44 battery holder for this machine. Both machine uses glass lens and the image quality are awesome. These cameras are truly "Analog" Photography, even the auto-exposure circuit is running in analog mode. If you are looking for a complete experience in Analog Photography, I highly recommend you to get one. As these cameras are coming from 1960s, problems or malfunctions are expected. There are many Land Camera enthusiast on the Internet, their experiences and the workaround suggested are a good resources to hack these machines. There are some "gear-head" modified their Land Camera from fully automatic shutter control to completely manual shutter control. Those are so cool. However, it may not be convenience to the user when every shots have to be light measured and adjust their shutter speed before they can take a photo. What if there is a solution to combine the best of manual shutter control and the best of automatic shutter control? 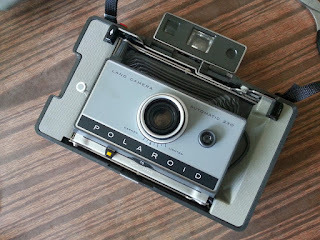 Now, I am planning to revitalize another Polaroid Land camera, probably a broken one. Add in a manual shutter control with an option to use the "A" (Automatic) mode. So, whenever I need an automatic shutter control for responsive photography, the option is there. Model #230, #340, #440 have plastic casing which may be easier to drill but their appearances (after these 50 years) cannot be good as the other models in metal casing. Now, the first step of this project is to find a good but electronically faulty Land Camera. I don't want to destroy my good-to-use camera without a reason.